Posted on Thu, Feb 2, 2012 : 5:04 a.m. 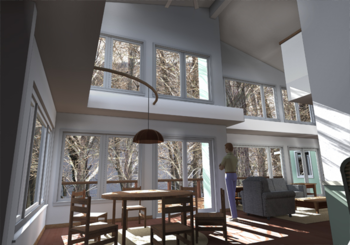 Architectural Resource and Old School Construction will sponsor a tour of an Ann Arbor home known as 'The Riverview House" on Saturday, Feb. 4 and Sunday, Feb. 5. 'The Riverview House" will be open for tours on Saturday, Feb. 4 and Sunday, Feb. 5. This remodeling project is registered with the National Association of Home Builders' National Green Building Certification Program with the goal of "Emerald," making it the first such remodel in southeast Michigan to attain the program's highest level of green certification. The public is invited to a enjoy a unique glimpse of the inner workings of a whole-house, deep green remodel — during its construction. Michael Klement of Architectural Resource and Ben Lutzeier of Old School Construction, the architects and builders on the project, will take attendees through the project on guided tours on Feb. 4 and 5, from 9 a.m. until 5 p.m. The free tours run every hour on the hour with the last tour beginning at 5 p.m. Additional information is available at www.visiblegreenhome.com or email info@visiblegreenhome.com. •Sign up for the weekly Business Review email newsletter here.